Gemstones are powerful tools which guide you toward personal understanding. The colors and shapes of the stones bring you messages to motivate and heal you in many ways. 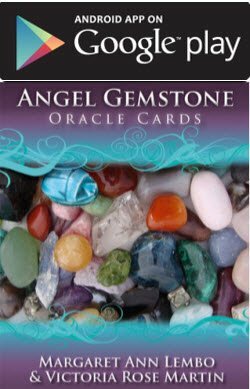 This deck of 44 oracle cards by Margaret Ann Lembo in collaboration with Victoria Rose Martin will familiarize you with 44 gemstones. They will bring you messages to increase your awareness. The messages on one side give you a reading. The angel associated with the gemstone on the other side of the card provides you with a positive affirmation to help you transform your reality. 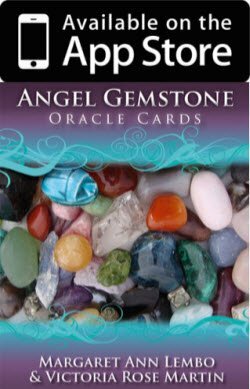 You’ll learn to give accurate Angel Gemstone Oracle readings for yourself and others as you use these cards regularly. You can browse through the deck, and search by keyword or crystal name. Once you select a crystal, double-tap the card to flip it over and read the angelic affirmation. Double-tap again to see the full crystal image and its meaning. You can then Tweet the card info, or email it to a friend. To scroll through the deck, you can swipe left or right to see the next or previous card. From the browse screen, shake the device to randomly select a crystal and its affirmation. Use this on a daily basis for a daily affirmation. Random cards are automatically tweeted to the @GemstoneOracle twitter account. Use the Meditation option for a short guided meditation to achieve a state of relaxation.